Announcing the Revised Human Resources Records Retention Schedule! The University Archives is excited to announce the publication of the revised Human Resources Records Retention Schedule! The University’s records retention schedules are the official university policies governing records retention and must be followed by all employees to ensure compliance with institutional, state, and federal regulations. The new Human Resources Records Retention Schedule is the official policy and supersedes any previous Human Resources records retention schedules issued by the University Archives. All units/offices should review the new schedule and implement it as appropriate. The schedule can be viewed and downloaded online at the University Archives website. The university’s previous records retention schedules were last revised in the early 1990s, and as such, this newest revision represents a major update to the University’s previous records retention policies. New record series for SIRS Evaluations, Time Records, Employee Personnel Files, and much, much more! New searchable, pdf format- easy to read and use! Because this new records retention schedule represents a major change for the university, University Archives staff will be available to present on the new HR Records Retention Schedule upon request. A presentation is already scheduled for March 22, 2017 as part of the ADUC program. Additionally, the University Archives is designing video tutorials to discuss the new schedule format and provide campus users with information on the most common record series and retention periods. Those video tutorials will be online soon! To request a presentation or additional information about the new retention schedule, please contact the University Archives at 517-355-2330 or archives@msu.edu. As the Semester Ends, It’s Time to Review Your Records! As we move closer to the end of the semester, it may be a good time to review your records and determine what you should keep in your office or transfer to the Archives in preparation for next year. The Records Management Program is happy to accept transfer of both temporary and permanent records in paper format. We also accept transfer of permanent records in electronic format. Both permanent and temporary records can be sent to the Archives through our transfer process. Permanent records have important historical value to the university and may include items such as meeting minutes, videos, reports, presentations, speeches, photographs, scrapbooks, and organizational histories. 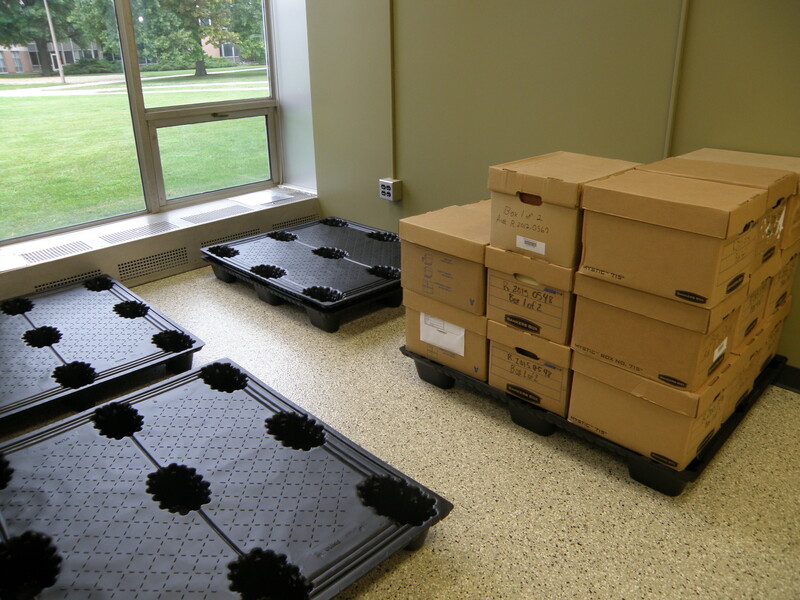 These records will be processed by the Archives and eventually become part of the University’s historical collection. Temporary records need to be retained for a specific period of time, and then can be destroyed once the retention period is met. Retention periods are set by the University’s records retention schedules. Please review the schedules for these retention periods. Temporary records sent to the Archives for storage will be retained until the end of their retention period; the Archives will then contact your office for approval to destroy the records. You may also destroy eligible temporary records in your office by completing and submitting an in-office records destruction form. Temporary records may include documents such as fiscal documents, student files, personnel files, search committee documentation, and general files. If it has been a while since you have transferred records to the Archives, don’t worry. The Records Management program has developed three new video tutorials to assist you with records management forms and procedures. These videos can also be found on the Archives website. Whether you are new to the records management process or simply need a refresher, these tutorials will provide you with detailed instructions for completing key records management processes. For additional information on transferring records to the Archives, please review the Archives website. You may also contact the University Archives at archives@msu.edu or 517-355-2330 for assistance. 2016 is moving right along, and the Records Management Program is happy to announce two new services to assist your office and department with managing your records: Inventory Completion and Full-Service Boxing. These services are offered at a cost to departments who may not have adequate staffing or resources to complete the records management transfer process on their own. However, offices and departments DO NOT have to use these services; they may complete the transfer process on their own for no charge. Details on the records transfer process can be found here. Users who purchase the correct records boxes and box up their records, but do not have the time to complete an inventory, may have Archives staff complete the records inventory portion of the transmittal form for them. Ensure all files are adequately labeled before they are boxed. Do not include hanging file folders. Complete and submit the first page of the transmittal form. Arrange for transfer of boxes to the Archives. Assign tracking number upon receipt of the transmittal form. Inventory the boxes when they arrive at the Archives. Send a copy of the completed inventory to the office. Archives staff will work with users who are interested in having Archives staff come to their office, box their records, and assist them with completing the transmittal form and inventory. This service is offered depending on staff schedules and will require a pre-arranged appointment. Submit the first page of the transmittal form to Archives. Arrange for transfer of boxes to Archives. Provide records boxes and box records. Assist with completing the first page of the transmittal form if needed. Assign tracking number for boxes upon receipt of transmittal form. Inventory the boxes once they arrive at the Archives. Send copy of the completed inventory to the office. The Records Management Program hopes these new services will provide departments and offices with more options for completing records management tasks. For more information about these services and fees, contact University Archives at 5-2330 or archives@msu.edu. Introducing the In-Office Records Destruction Form! University offices produce a variety of records on a daily basis, and sometimes departments do not have the staffing, time, or ability to box and ship records to off-site storage with University Archives. If, due to necessity, you must manage, store, and ultimately dispose of your records in your own office, you are still responsible for following all records management policies and procedures, including ensuring that all records destruction is authorized by the University Archives. The records management program can now assist you with documenting records destruction with its In-Office Records Destruction form. 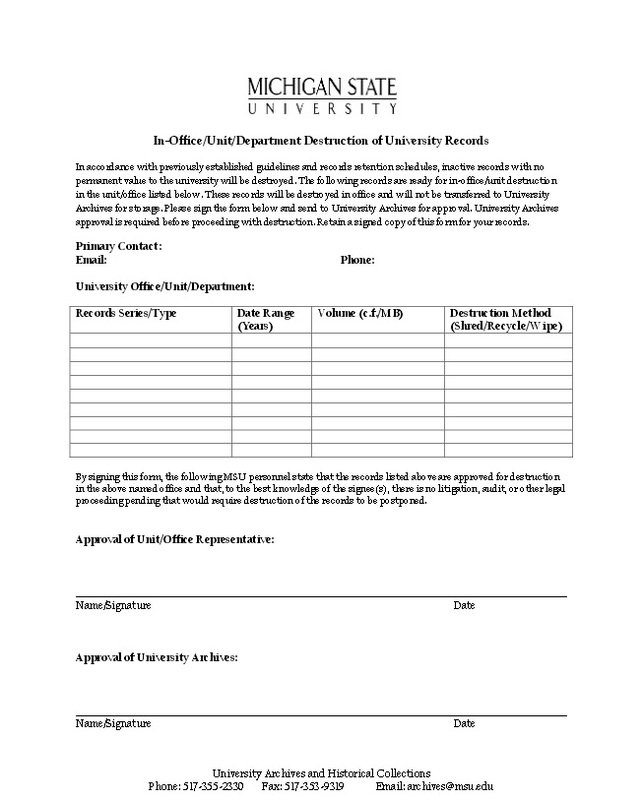 Both the form and detailed instructions can be found online at http://archives.msu.edu/records/destruction.php?records_transfer_destruction. Archives may need to contact you if there are questions about your records. Then, identify the record type, date range, volume, and destruction method of the records you have to be destroyed and complete the chart on the form. Record type can be determined using the University Records Retention Schedules. You may view the retention schedules online or contact the Archives at 5-2330 with any questions. Date range is typically a range in years. Volume refers to the amount of records to be destroyed. Paper records are measured in cubic feet. Typically, one file drawer equals two cubic feet of paper records. Destruction method refers to how you plan to destroy the records. For paper records, that is usually “Shred”. Once the form is complete, sign the form, or have your department representative sign the form, and send it for review to University Archives at archives@msu.edu. DO NOT PROCEED WITH RECORDS DESTRUCTION UNTIL YOU RECEIVE ARCHIVES APPROVAL. The University Records Manager will review the form and contact you if there are questions. Then, the University Archivist will sign the form and approve the records destruction. This process may take 1-3 days, although Archives tries to process the forms as soon as possible. A signed copy of the form will be emailed to your office. Once you have received a signed form, you may proceed with records destruction. Please retain a copy of the signed form for your records. Archives will also retain a signed copy of the form. While completing this process may be a change for many offices, completing the In-Office Records Destruction form will create necessary documentation in case of future records requests and will ensure your office’s compliance with University regulations. If you have any questions or concerns about the form, please contact University Archives at 5-2330 or at archives@msu.edu . As a new school year begins, you may look around at the paper files and documents in your office and think: Where am I going to store these documents? I have no space! University Archives recently constructed a new records management area for staging and processing of university records. University Archives can help! The University Archives’ Records Management Program provides a variety of services to assist departments and offices with identifying, storing, and organizing their university records. What kind of documents do you create in your office? Are they university records? Are they considered permanent or temporary? The Records Management program creates and manages the University’s records retention schedules, which will tell you what records to keep and for how long. If a record your office creates is not mentioned in the University’s general schedules, the Records Manager will work with your office to craft specific retention schedules to meet your needs. For more information, visit our retention schedules at archives.msu.edu. Just because you need to retain a document for 6 years doesn’t mean you have to store it in your filing cabinet. The records management program provides storage to offices/departments free of charge (all you need to purchase are the boxes). This storage service allows you to store your temporary paper records off-site until they are eligible for destruction. University Archives will then store the boxes and contact you for approval when they are eligible for destruction. You can even request the return of materials if they are needed for review or audit. This service will free up your office space and help ensure that your records are retained for the full required retention period. For more information, check out the records transfer process at archives.msu.edu. Do you have questions about how to organize, file, and otherwise manage a variety of records, both in paper and electronic formats? University Archives provides free records management consultation on a variety of topics, including shared drive organization strategies, file naming conventions, and general records management best practices. The Records Manager is available to meet on a one on one basis or can present to a whole office if preferred. Contact University Archives at 5-2330 or archives@msu.edu to schedule a consultation. Looking to explore any of these services? Check out the Records Management program on archives.msu.edu for more information. Did you know that April is Records and Information Management Month? This week is Organize Your Files Week. Doesn’t sound very exciting, does it? Try as I might I couldn’t find a way to spice up records management. Even to records management professionals, records management can seem a bit dull. OK, so records management is essential, but dull and I need to do it for legal reasons. Are you still awake? Whenever people start talking legalese with words like compliance and regulations, I just start to doze off. You will avoid the frustration of tracking down that file that you know you created but you can’t remember where you saved it or what your file name was. It made perfect sense at that time, but now you are stressed/rushed/exhausted and can’t remember what you did before. You will impress your boss with your organizational skills. Love ‘em or hate ‘em you will be the person who is always able to find what is needed in an emergency. Getting positive attention from the boss is usually a good thing. Do I have to save that? Can I delete that? Is your email inbox more stuffed than that closet at home that you swear you will clean out one rainy day? (But, let’s face it, you are never going to do it.) Knowing what to save means something else – knowing what you can delete. If you have made it this far, I feel you deserve a nice prize for reading about organizing your files. I don’t have a prize for you, but know that you definitely deserve one. For those of you who are really interested and want to know more, then I suggest you check out our records management website. For those of you whose brain is overloading, you can take a look at the pictures on our Flickr site. We don’t have cute cats, but we do have lots of photos of cows. Hopefully, they can ease the pain of thinking about organizing your files. It has been a very busy year for the University Archives & Historical Collections. We would like to thank all the individuals and departments who have supported us throughout the year. We accomplished quite a bit and we could not have done it without your support. We made great strides toward increasing our online presence this year. Our new website was launched in May. The website has an expanded section on Records Management and links to our other online sources. This year we also launched a Flickr page, making more photographs available to the public. We continued to add content to On the Banks of the Red Cedar with new exhibits on Forest Akers and the Colleges of Osteopathic and Human Medicine. The University Archives had several public presentations this year; most notably, we sponsored the film Spartacus for the East Lansing Film Festival. Cheers for the film were recorded at MSU and 2010 marked the 50th anniversary of the film. We are pleased to report that Spartacus tied for the audience favorite award at ELFF. We also held our annual American Archives Month trivia contest in October. The UAHC hosted an open house for members of the Mid-Michigan Alumni group that coincided with the first ever National Preservation Week. Staff from the UAHC gave several presentations to local organizations. We would like to thank the College of Agriculture and Natural Resources for allowing us to participate in several of their events. The UAHC was present for both Ag Expo and the Great Dairy Adventure for the third year in a row. The staff working the booth at Ag Expo would also like to thank whoever put our booth right across the aisle from the Dairy Store with their free, yummy ice cream. Great strides have been made toward improving the records management program on campus. In addition to the increased information on the website, we also have a new brochure and Director Cynthia Ghering has been giving presentations to campus groups on general records management procedures, email management, and scanning and attachments. This year also saw the start of the three-year “Spartan Archive” project in which the archives is working to develop an electronic records archive for the university’s born-digital records and publications. Though it seems to us that we accomplished much, we know that there is always more to do. In 2011 be on the lookout for more records management related classes, more materials available digitally, the “I Found it in the Archives!” campaign, and our kickoff to the Civil War Sesquicentennial.